The possibility for starting anew attracts those dedicated to making a better way of life for themselves and others. From the Gold Rush prospectors to the bungalow brigade, millions have flocked to the hills and valleys of the Los Angeles area in search of a better life. The nurturing natural environment and open-minded cultural ambiance have long fostered a native tradition of innovative house design. Early experiments in residential architecture engaged the local traditions of adobe construction and Spanish Revival style, combining these with the newly emerging modern dream of a healthy, open, free-spirited way of living created by means of new materials and methods of construction. Like their Northern Californian counterparts, during the first three decades of the 20th century Southern California Modernists such as Irving Gill, Greene and Greene, George Washington Smith, Wallace Neff, Rudolph Schindler, and Richard Neutra practiced architecture “with an eye sensitive to a particular notion of context and an expressive use of local materials,” as architectural historian Paulette Singley once put it. Like the plein air painters, these designers were fascinated by the intoxications of life in the open air. Across the street from Schindler’s West Hollywood Kings Road House, Gill’s Dodge House experimented with the possibilities of outdoor living rooms, built-in furniture, and rooftop sleeping porches. Applying modern efficiency and simplicity to the construction traditions of New Spain, the design of the Dodge House also merged the building with the “little garden, lying so close to its Spanish house as to be an outside living room” in the “sun-flooded landscape” of early Los Angeles, Deborah Fausch once said. These architects’ unique experiments in residential design continue to inspire research into new ways of living—the hallmark of Southern California houses. In the postwar years, the Case Study House program explored open-air California living in dramatically sited homes. 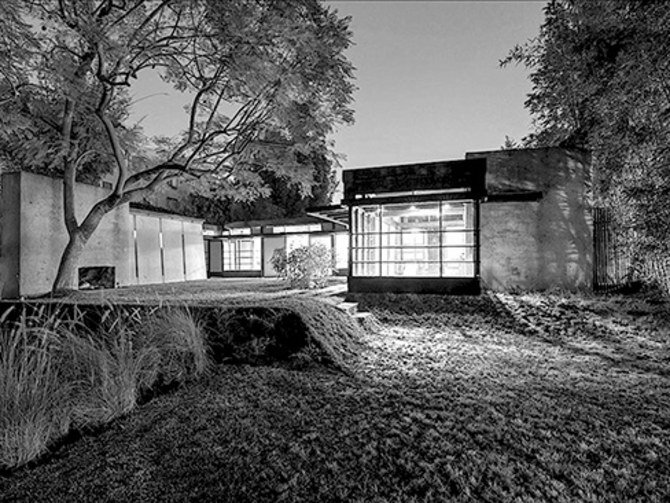 Two good examples are Pierre Koenig’s Stahl House, with its cliff-hanging view of Los Angeles at night, and Charles and Ray Eames’s proposal for modern modular living, with its open loft plan, light steel-frame-and-glass construction, matching furniture of their own design, and comprehensive collection of everyday life objects. Along with designers such as Cliff May, they sought to create a new, carefree, specifically California approach to life that could intersect with the environmental exuberance of urban styles and house types that Reyner Banham called “surfurbia,” the “foothills,” “the plains of id,” and “autopia”—architectural reflections of the beaches, the hills, the sprawling flatlands, and the freeways of metropolitan Los Angeles.